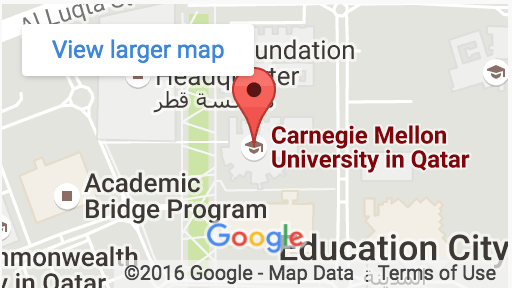 Carnegie Mellon University in Qatar welcomes applications from post-secondary students who would like to transfer. A minimum of two semesters of university-level coursework is required for all transfer applicants. Application requirements such as secondary school transcript submission, standardized testing, and counselor and teacher recommendations are the same as for first-year applicants. Both secondary school and university transcripts are necessary to complete a transfer application, along with the QAR 250 (or $70 USD) application fee. A formal transfer credit evaluation will be given to admitted students shortly after the admission offer is made. Transfer credit is considered on an individual basis, and Carnegie Mellon University in Qatar may award elective credit for courses with no Carnegie Mellon equivalent. Transfer applicants should be prepared to submit descriptions of university courses they have taken. Courses in which the student is enrolled during the application process will be reviewed, but granted credit only when successfully completed. Grades are not transferred—only credit. Sometimes transfer students will be required to take specific courses, accumulating more courses than students who complete their entire degree at CMU-Q. The time it takes to graduate will depend on completing CMU-Q’s degree requirements, not on the class standing at a previous institution. Transfer students can receive financial aid from Qatar Foundation. or contact the Office of Admission at tel. 4454 8500 or email ug-admission@qatar.cmu.edu.